Fr. 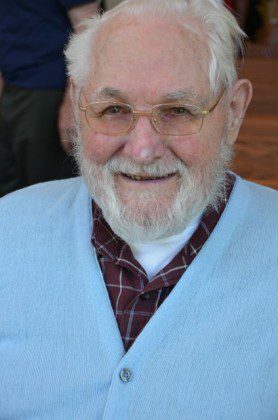 Leonard Tadyszak, SCJ, the eldest member of the US Province at 96, died September 16, at the Congregational Home in Brookfield, WI. He recently celebrated his 74th anniversary of profession. It was while he was chopping logs with the CCCs (Civilian Conservation Corps – a program that put young men to work during the Depression) that he started to think about a vocation. “After seeing that ad I just wrote to them [the Priests of the Sacred Heart] and told them I wanted to join,” he said. Soon after, he received a letter from Fr. John Emonts, SCJ, saying that the priest he had written to, Fr. Henry Hogebach, SCJ, had just died in a car accident. “But he added that I was still welcome to come to Hales Corners – I guess they didn’t have much of an admissions process then,” said Fr. Tady, laughing. At 19 he was considered a “PG” or “post-graduate” student, so he was placed in an intensive two-year Latin program at the minor seminary in Donaldson, Ind. He completed his seminary studies at Sacred Heart Moanstery and was ordained to the priesthood in 1952. Like many newly ordained priests at the time, his first assignment was back at the seminary. “They needed teachers, so that’s where we went,” said Fr. Tady. He became a Latin teacher at Divine Heart Seminary. In 1961, he took on a totally new assignment – he left for De Aar, South Africa. Fr. Tady enjoyed being a missionary and stayed for four years before returning to the U.S. Province. Then, it was back to school. He served at Trinity College in Redlands, Calif., Sacred Heart Seminary in Victorville, Calif., the novitiate programs in both Ste. Marie, Ill. and in Baileys Harbor, Wis., and at Kilroe Seminary in Honesdale, Penn. After many years in education, Fr. Tady became a “pinch-hitter” of sorts, filling in at parishes when others were on vacation, or serving as a fill-in until a permanent SCJ was assigned to a location. In 1992 he retired, and for several years split his time between the province retirement communities in Pinellas Park, Fl. and Franklin, Wis. At the time of his death he was a member of the Sacred Heart Community at SHML, with residence at the Congregational Home in suburban Milwaukee. Funeral services for Fr. Leonard are scheduled for Thursday, September 20 at Sacred Heart at Monastery Lake in Franklin, WI. Reception of the body/visitation will begin at 9:30 am. The Mass of Christian Burial will begin at 10:30 am. Interment will follow at Sacred Heart Mausoleum.